If like me you were loving the heatwave we were having here in the UK then you will have be loving getting out and enjoying the outdoors and fingers crossed for continued good weather. I am lucky to have a beach as my front garden so it really is a summer to make the most of. The downside of the heat is the possible Ill effects on our health, sun stroke, sunburn and dehydration. For us adults we can physically get up and get ourselves a drink however the majority of us are probably still not drinking enough to make up for the loss of fluids through sweating etc. It is then vitally important we are aware of the amount of fluids our little ones are getting as many will not simply get up and help themselves or even ask. Infants and young children have a higher proportion of body water than adults. They are also less heat tolerant and may be more likely to get dehydrated, especially when being physically active and in hot climates. Encouraging children to drink fluids regularly is really important as children may not remember to have a drink by themselves. So what can we do as parents to help? Investing in a SIGG kids’ drink bottle not only keeps thirst at bay but ensures toddlers to teens stay healthily hydrated throughout the day. 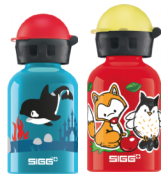 Meet the latest fun and practical range of kids’ drinks bottles from premium reusable bottle brand, SIGG! Whatever the colour, size or design you choose, all SIGG bottles are BPA free, easy to clean and have taste neutral properties. What’s more they’re lightweight, durable and all are Swiss made; perfect for school and sports through to family adventures and use at home! SIGG Kids is the original bottle for youngsters and is made of aluminium. Available in 0.4 litre and 0.3 litre sizes, the latter is perfect for toddlers to handle, and all come with a protective cap and easy to clean top. But, most importantly, they’re all 100% leakproof. Available in a fantastic range of imaginative designs and bright colours, there’s also a host of licensed bottles to choose from – everything from Star Wars, Hello Kitty, Disney. The recently launched SIGG Miracle Alu bottle is so much more than a conventional drinks bottle. Made of durable aluminium, there’s no need to tilt to enjoy your drink as the straw is included in the bottle and the spout is always protected from dirt and germs. SIGG Miracle Alu is available in 0.4 and 0.6 litre sizes (RRP £15.99 for the 0.6l) and for toddlers, there’s 0.35 and 0.4 litre sizes, both made from Triton. 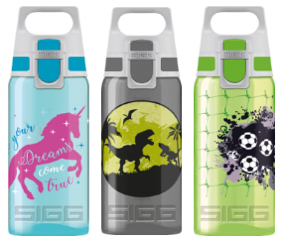 SIGG VIVA is perfect for those kids on the go. With its innovative ONE lid you can open, drink, close and secure with just one hand. VIVA also comes with a safety lock to avoid any accidental spills. Made from transparent polypropylene, this 0.5 litre bottle is available in 20 different colourways including the bestselling unicorn design (RRP £12.99). 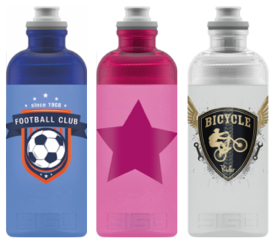 In addition, SIGG’s HERO range offers a choice of three 0.5 litre reusable bottles featuring, football, cycling and star designs. For more information on SIGG and its products, please visit: uk.sigg.com.